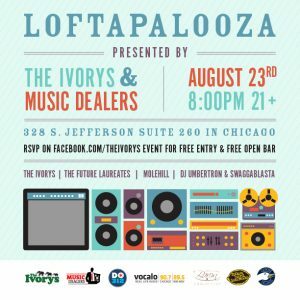 We’re stoked that Music Dealers and The Ivorys invited us to play at Loftapalooza on Saturday 8.23. Also performing are The Future Laureates. This is a FREE event & you get FREE beer. The only thing you have to do is join the Facebook event or RSVP to the D0312 Event. You will then be added to the guest list.